SiTek Electro Optics already wide range of standard PSDs is now further improved with a new type of PSD detector, a PSD array. The PSD array consists of 16 parallel one-dimensional PSD elements on the same chip, each element with a length of 2,5 mm. As with many 1-dimensional PSDs the PSD array might be of most use in triangulation applications. However, by using a laser line or multiple light spots instead of a single spot it is possible to gather information not only about the height at a certain position but also about the contour of the illuminated object. The possibility to read out all 16 PSD elements in parallel together with the fact that the performance of the PSD array has been optimized for high speed operation with a rise time of each element of less than 100 ns makes the PSD array suitable for applications like high speed 3D contour measurements and measurements of parallel, moving objects such as cantilevers. 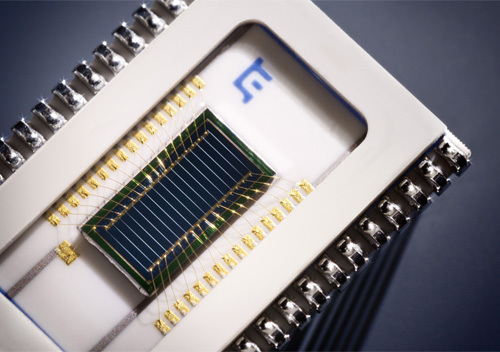 To ensure high sensitivity the design of the array has been optimized with a gap between the elements of only 10 um. This gives a fill factor of more than 97 %, still with a cross talk less than 1 % and a non-linearity value in line with SiTeks other one-dimensional PSDs. In order to preserve the excellent performance also under stray light conditions the PSD array has been designed with SiTeks unique built in stray light elimination feature. This patented design eliminates the decrease in speed and linearity which otherwise might occur when operating a PSD under stray light conditions. 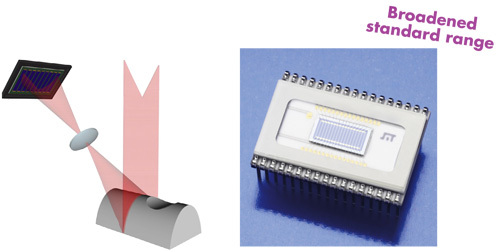 The PSD array is assembled in a 34 pin dual in line type ceramic package with a protective window. In order to minimize the size of the package a pin pitch of 1,27 mm has been used giving a package size of only 21,6 x 15,0 mm2! As with all of our standard PSDs, the PSD array can be customized for optimized performance under certain conditions. Such customization could for example be a different size or number of segments, enhanced UV or YAG reponse or an SMD type package. The standard PSD-array is now available from stock and SiTek are ready for any incoming request.